Heavy-duty printer for ID and shipping container marking in manufacturing facilities or warehouses. 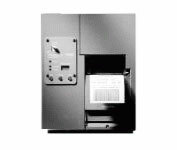 9805 Stationary Thermal Transfer Printer (203 dpi with RS232 Interface, Full Metal Cover, 1D/2D and Color Printing) Monarch Marking Systems 9805 Printer is part of a complete family of easy solutions for identification and tracking. It is an economical, heavy-duty tabletop printer designed for item ID and shipping container marking in manufacturing facilities or DC warehouses. Thermal Labels, 1.2" wide x 1.1" tall white Direct thermal labels for the PathFinder Printer. 515 labels/roll, 50 roll case.